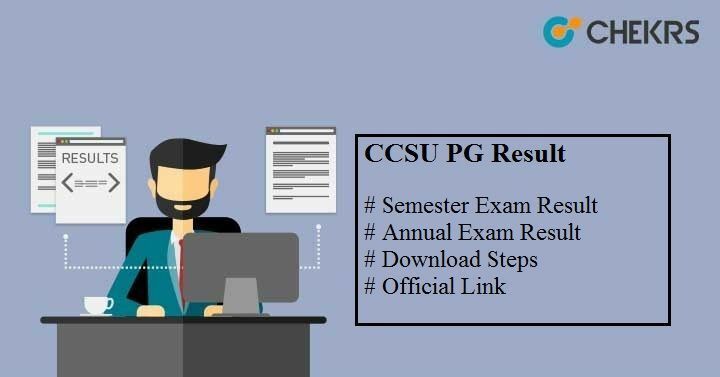 CCSU PG Result 2019: Candidates who appeared in the examination of the Chaudhary Charan Singh University, Meerut (CCSU) of the postgraduate program can check the result from this page. Latest Update: Various PG Result Announced!! Check the link and Table Below. The university will release the remaining result of semester and yearly program very soon on the official portal i.e. ccsuniversity.ac.in. To get the result from the official portal many candidates faces the problem as they don’t know the proper process to download the CCSU PG Result from the official portal. So to solve this problem we are providing here the complete information regarding the CCS University PG Result 2019. Recently the CCSU, Meerut has released the result of the M.Ed. 2nd sem. So candidates who appeared in the M.Ed. 1st sem exam can check their result by simply clicking on the link given below. For the other CCSU PG Result 2019, we will soon provide here the link. We collaborated here some points which will help the candidates to download the CCS University PG Result successfully from the official portal. The steps are given below. After the official site open there is a block available name as “result”. Click on it. A new tab open under which the link is given on the line Regular/ Private/ Professional Courses Result. Click on it. A tab appears in which students need to select the course, Year/ Semester, Roll No. At last click on the submit button. The result appeared on the screen. Save the result for the future use. Note: Candidates are also able to download the result of the other PG courses also which is offered by the university like LLM, M.P.Ed., M.Com., M.Sc., MJMC, MA, M.LibISc., MPES, LLB, MBBS, MD/ MS, MBA, M.Ed., M Phil courses also. Those candidates who don’t satisfy with their marks is informed that the university provided them another chance to recheck their result in from of the CCSU Revaluation Form 2019. So candidates who are interested in rechecking their copies they can apply for the revaluation form. The revaluation form is available either at the official website or at the university office counter. The Chaudhary Charan Singh University (CCSU) is also known as the Meerut University was come into existence in the year 1965. The university campus is spread over the 222 acres of land and is affiliated through the UGC. Hope the details given here will help the candidates to get the CCSU PG Result if there are any queries please mention it through the comment box given below. We will soon reply to the answer of your queries.